Anti-cradle cap shampoos designed to be used from the very first day of your babe’s life are hard to come by. And in the promise of finding one, you want to be 100% sure of its safety. 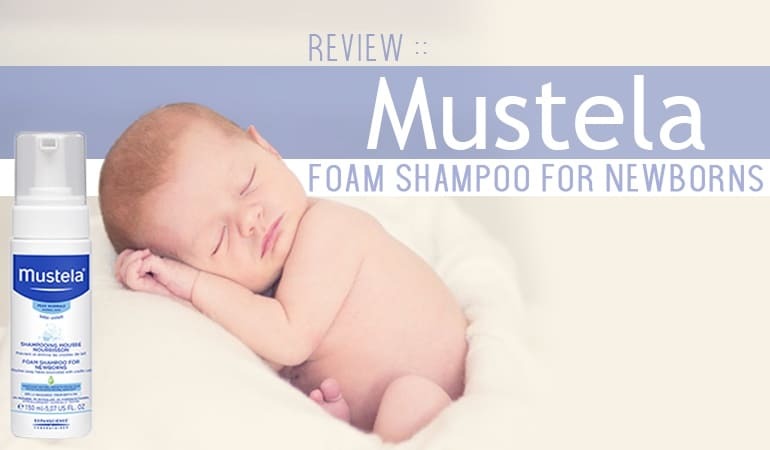 Mustela foam shampoo for newborns is a diamond in the rough, featuring well proven anti-cradle cap/anti-dandruff actives with above and beyond safety testing in a daily use formula. It is worth bearing in mind that it isn’t fragrance-free, and salicylic acid can cause dryness after prolonged usage. But as a treatment to combat established doses of cradle cap – you’ll struggle to find a more effective treatment on the market. It can be a minefield trying to find a cradle cap treatment for your newborn. You want it to be sensitive skin friendly but also to tell you yes it’s ok to use me from birth. You want a product which has just a few select ingredients and you want the ones it does have to work. You want a treatment with proven efficacy, but you want that efficacy to be natural and kind to skin. Mustela foam shampoo for newborns has the potential to place a firm tick into each of these boxes. With a formula made from just 13 ingredients combined with a naturally found cradle cap anti-fungal plus exfoliating active ingredient, Mustela foam shampoo could be the natural, gentle yet effective everyday solution you’ve been looking for. But before we speak to the Mustela form shampoo formula, let’s take a look at who makes it. Are they trustworthy? Do they have strong safety standards? Are the company a market success? 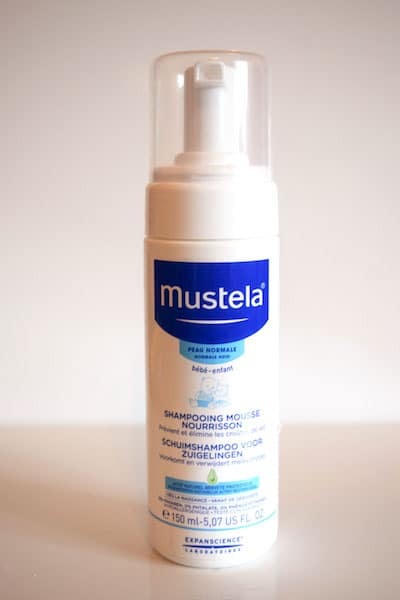 Mustela foam shampoo is made by a brand called Mustela and a company called expanscience laboratories. With a range of over 50 products specialized at treating the skin of babies and their mums, they’ve grown a long way since their launch in 1950. At which time they launched Europe’s first ever cleansing lotion for babes – previously all mums had to choose from was soap. Mustela’s promise to develop products designed to nourish and protect the skin of babies and their mothers has led them to file 635 patents in the last 15 years – a strong sign Mustela formulas go above and beyond the market average. In fact, they also have an entire research program dedicated to studying the skin of newborns in their very first few days of life. The icing on the cake – all Mustela formulas proceed through an added layer of testing above and beyond what is legally mandated to prove all Mustela formulas pose absolutely no risk to the unborn child or babies being breastfed. An unusually high standard we do not find often at Dandruff Deconstructed. Mustela foam shampoo for newborns looks to be made by an extremely reputable company. Now onto the shampoo itself, how does it arrive? Coming in a 150ml foam pump bottle, Mustela offers an easy to use, easy to dose formula. The branding is clean and clear with a clinical feel – only the very small picture of 2 teddy bears on the front label are a visual give away of its intended use. 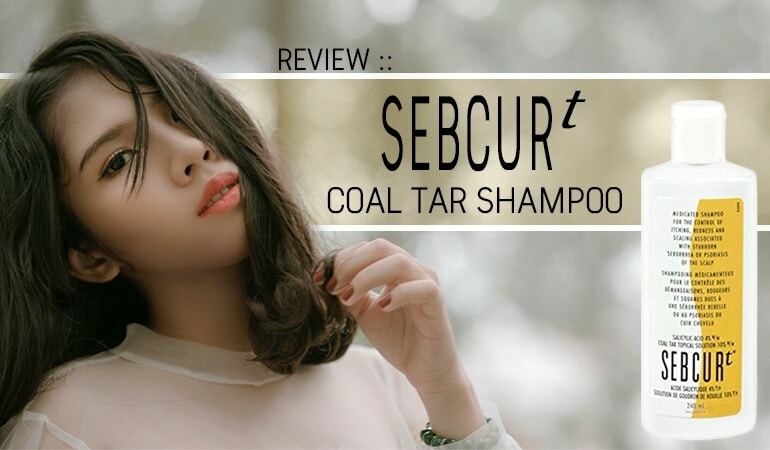 Which also comes with the promise of containing 0% parabens, phthalates or phenoxyethanol. Mild, kind to skin formulas can often struggle to produce foam. (Foam isn’t a measure of cleansing power by the way, but rather an aid for spreadability.) Mustela’s unique foaming pump counteracts this by producing a very helpful pre-foam via its pumping action. Another box ticked for Mustela foam shampoo for newborns, next step – how does it wash? In one word, perfect. Exiting the bottle as a dollop of pre-foamed shampoo the Mustela foam shampoo formula is easy to massage around your baby’s scalp and just as easy to cleanly wash out. It works well and has a recognizable new baby scent. The only point of note would be a slight feeling of dryness immediately after washing. However, as your baby’s experiencing cradle cap it’s likely their oil glands are overproducing and therefore Mustela foam shampoo could have a helpful oil balancing effect. It’s worth bearing in mind all the same. 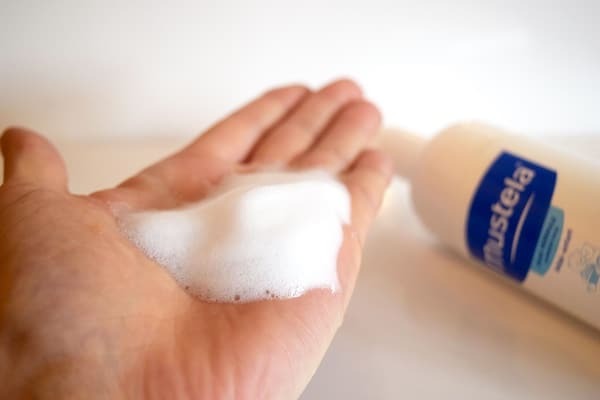 Now onto the most important bit – the Mustela foam shampoo formula. 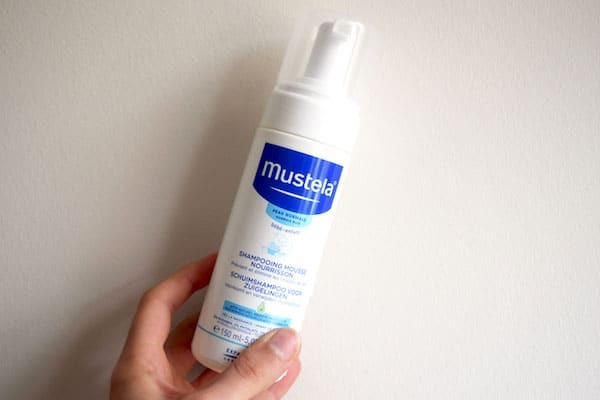 Are Mustela using proven to work anti-cradle cap ingredients? Are they in concentrations which will work? Climbazole helps treat your babe’s cradle cap as an anti-fungal active because the cause of cradle cap is thought to be the same as the cause of seborrheic dermatitis – an overgrowth of a yeast called Malassezia. A yeast that thrives in areas of oily skin. 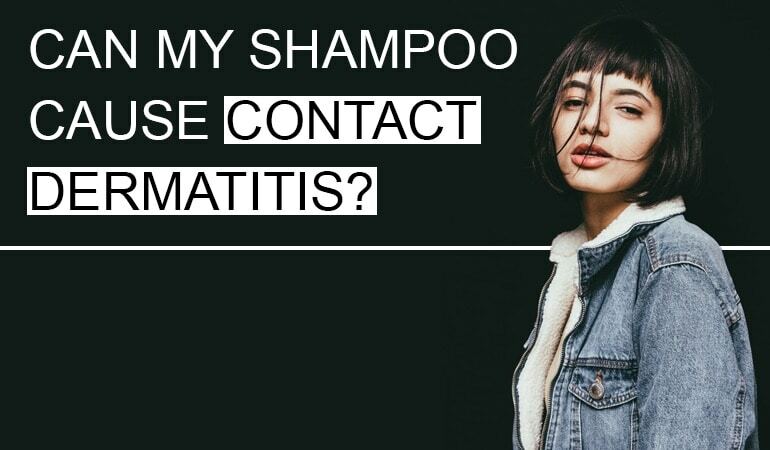 A 2001 published study concluding a shampoo using 0.65% climbazole was able with 4 weeks of use to show a successful reduction of dandruff, redness and itching in 80% of volunteers, with the remaining 20% seeing mild improvements. A 2009 study of 120 volunteers showed anti-dandruff shampoos containing natural climbazole to be more effective than a commonly used, non-natural anti-dandruff active called piroctone olamine. A 2011 published study concluded the efficacy of 0.45% climbazole when used in combination with 0.5% piroctone olamine to have the same effectiveness as a traditional 1% zinc pyrithione formula however with improved hair conditioning advantages. Great evidence for the efficacy of Mustela’s foam shampoo, of which we’d take an educated guess at containing a 0.5% dose. An active ingredient which can be helped and boosted by the use of salicylic acid. Salicylic acid is what’s known to dermatologists as a keratolytic aka an ingredient which can soften dead layers of skin allowing them to exfoliate away more quickly than normal. In the case of cradle cap, crusty dead skin clumps hang on for too long becoming visually noticeable and itchy. Salicylic acid can help soften them away specifically for conditions of cradle cap, psoriasis and seborrheic dermatitis. While Mustela’s use of climbazole can help stop the effects of your baby’s cradle cap, salicylic acid can help get rid of existing crusty cradle cap flakes. A formula which can immediately show benefit also with long-term cradle cap control. Now onto the remaining formula of 11 ingredients – are there any others worth paying attention to? Perfume – which could potentially irritate sensitive skin. Avocado fruit extract – which has conditioning and soothing properties. The only negative we could draw from Mustela’s formula is their use of perfume which is not needed for functionality and instead could potentially cause allergy or irritation – in extreme cases. However, on the plus side, the perfume Mustela use does not have declarable allergens and therefore is likely to be more skin friendly than most other natural, essential oil containing formulas. 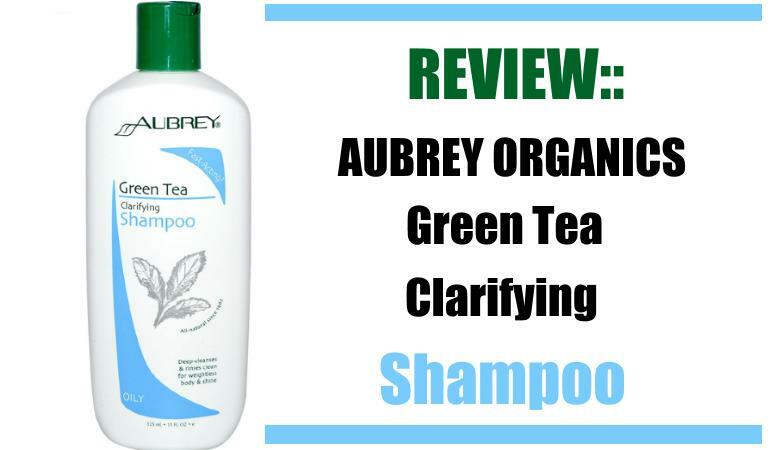 Overall, this is a gentle, well-formulated shampoo that should is designed for the more established cases of cradle cap. It is worth bearing in mind that it isn’t fragrance-free, and salicylic acid can cause dryness after prolonged usage. But as a treatment to combat established doses of cradle cap – you’ll struggle to find a more effective treatment on the market.